It’s a small rectangle, the size of a box of baking soda, but it revolutionized the world of Torah study. Known as a “Chitas”, it is a book that combines Chumash, Tehillim and Tanya. The compendium, which is almost as thick as it is wide, was the brainchild of Rabbi Zev Dov Slonim of Jerusalem, who passed away on Jan. 1 at the age of 83. Slonim was born in Jerusalem in 1934, not long after the Hebron massacre of 1929 had effectively ended Jewish life in Hebron, where his family was considered Jewish aristocracy. His paternal grandfather, for whom he was named, had served as the chief rabbi of the city’s Chabad community until he met his premature death at the hands of an Arab who had attempted to seize control of the historic Avraham Avinu Synagogue. His parents, Rabbi Yehuda Leib and Sheina Liba Slava, relocated to Jerusalem just a few months before the massacre would claim the lives of many of Hebron’s Jews, including members of the Slonim family—descendants of Rabbi Yaakov Culi and Menucha Rochel Slonim, son-in-law and daughter of Rabbi Dov Ber Schneuri, the second Chabad rebbe. As a young child, he was recognized for his devotion to Torah study. When Rabbi Eliezer Silver, president of the Union of Orthodox Rabbis of the United States and Canada, visited Jerusalem, young Zev Dov was called to be tested by the visiting dignitary, demonstrating his proficiency in Talmud. In his youth, he studied in Chabad Yeshivat Torat Emet, which had its roots in Hebron but had since reopened in Jerusalem, as well as in the Mirer Yeshivah. After his marriage to Gitel Leah Feldman in 1959, the couple settled in Jerusalem, where he devoted himself to in-depth Torah study. Three years later, he traveled to New York, where he met the Rebbe—Rabbi Menachem M. Schneerson, of righteous memory—for the first time. The Rebbe encouraged him to overcome his natural humility and to speak publically and teach others. Although he was naturally reserved, in 1970 his fine qualities came to the attention of the municipal authorities, and he was appointed to serve as chief rabbi of Central Jerusalem, a task he would devote himself to for nearly five decades. Among other things, this task brought him into contact with the inmates of the Russian Compound prison. In 1979, at the behest of the Rebbe, he was appointed as a member of the Chabad-Lubavitch Rabbinical Alliance in Israel. Widely regarded for his halachic acumen, he served as posek (decisor of Jewish law) for the Jerusalem’s Chassidic chevra kadisha (burial society), a role that brought him into close working contact with many leading Chassidic rebbes. For years, he served simultaneously in three separate synagogues. He was the rabbi of the Nachalat Shiva, the oldest synagogue in the New City of Jerusalem, as well as at the synagogue in the Bikur Cholim Hospital. He also served as spiritual leader of the historic Chabad synagogue in Mea Shearim, located on Baal HaTanya Street, named for his ancestor, the first Chabad rebbe. A methodical scholar, starting in 1968, he assisted the late Rabbi Menachem Kasher in compiling the Torah Sheleima, an exhaustive encyclopedic commentary on the Torah. He also authored several Torah books of his own. Yet his most far-reaching contribution may have been the Chitas, which he and his wife conceived in 1981 as a memorial for his late father. After receiving the Rebbe’s enthusiastic encouragement and advice regarding the endeavor, they went to press with a brief treatise compiled by the rabbi about the importance of daily study serving as the book’s epilogue. The book has since been reprinted dozens of times. 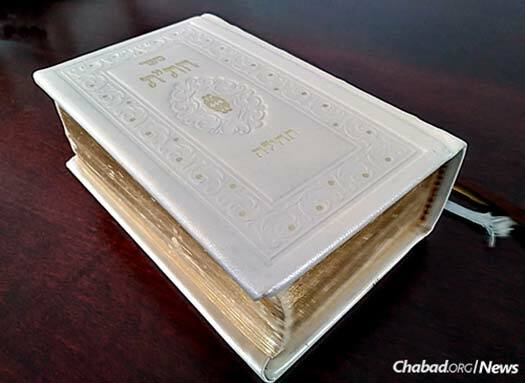 During the ensuing decades, a siddur (prayerbook) and Hayom Yom (a daily calendar that includes a Chassidic aphorism, anecdote or teaching for every day of the year) were added . . . and the classic Chitas was born. Its contribution turned out to be immeasurable, as it allowed people to carry with them just one book that would facilitate their remaining current in the daily study regimen laid out by the Chabad rebbes. In Israel alone, thousands of volumes have been placed in military tanks and motor vehicles. In addition to ensuring that the soldiers would always have something to study, the Chitas is seen as a source of Divine protection. In recent years, the Chitas gave rise to Chabad.org’s daily study section, as well as to weekly pamphlets (notably the English-Hebrew Chayenu), which allows students to carry an even thinner volume with just that week’s study syllabus, along with a translation, commentary and other additions that would not fit into the traditional Chitas format. Slonim was predeceased by his wife in 2014. He is survived by their children, all of whom serve as Chabad emissaries: Rabbi Aharon Slonim (Binghamton, N.Y.); Rabbi Shneur Zalman Slonim (São Paulo, Brazil); Hadassah Osdoba (Jerusalem); Rabbi Yosef Yitzchok Slonim (Jerusalem); Rabbi Baruch Slonim (Modi’in, Israel); Rabbi Tzvi Hirsh Chaim Slonim (Mitzpe Ramon, Israel); and Rabbi Yaakov Slonim (Givat Mordechai, Israel). He is also survived by his sister, Devorah Kesselman of Kfar Chabad, Israel; as well as many children, grandchildren and great-grandchildren. 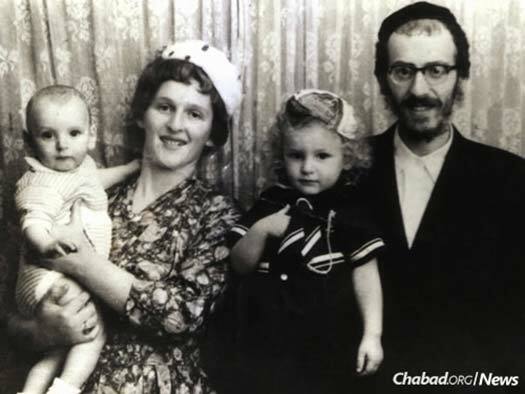 With his wife, Gitel Leah, and two of their children. 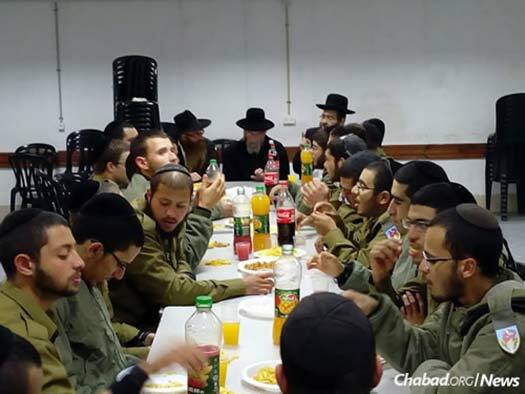 Slonim shares a Torah thought and a meal with members of the Israel Defense Forces. Thousands of Chitas volumes have been placed in military tanks and motor vehicles. 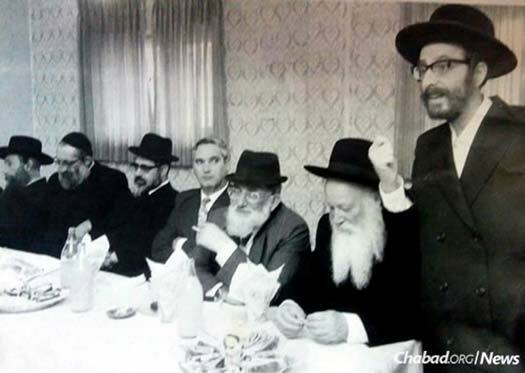 Slonim speaks at a meeting that included the late Rabbi Ovadia Yosef, fifth from left, the Sephardi Chief Rabbi of Israel from 1973 to 1983.